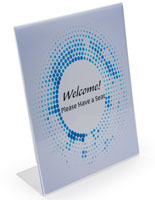 11" x 14" 11" x 17"
This acrylic display frame is a countertop sign holder commonly seen in restaurants and business lobbies. 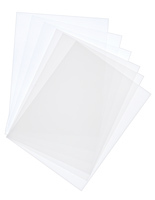 Each slanted picture holder is manufactured from one solid piece of acrylic. 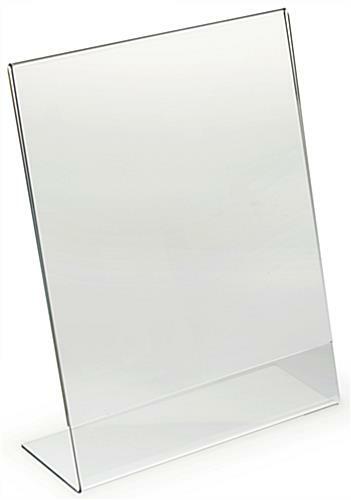 This acrylic display frame that is seamless is less likely to break or crack than other similar units that are bonded together. 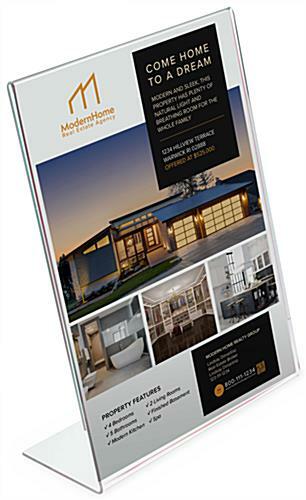 The fold over design allows for quick and effortless sign changes. Update this acrylic display frame by sliding old prints out through one side and replace with new graphics through the opposite side. 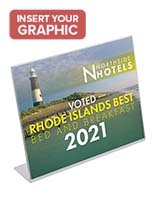 The 8.5" x 11" size allows users to print new signage straight from a standard office printer. 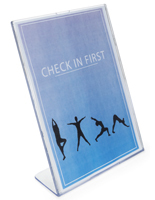 Each acrylic display frame features a 3" wide lip on the back of the unit to keep the print holder upright. This angled sign holder provides an effective means of posting permanent signage within an office space. 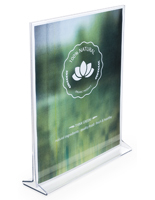 This acrylic display frame, cost-effective picture holder, is suitable for framing a certificate or award to keep on a desk or in a cubicle. The edges on this print display are polished to a crystal clear finish. 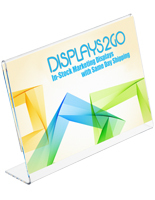 Be sure to order this acrylic display frame in bulk quantities to receive the lowest prices! 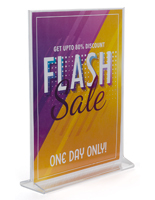 Same day shipping is available for this discount sign holder when ordered before 3PM EST weekdays. 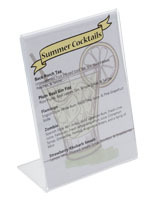 8.3" x 11.0" x 3.0"
These acrylic sign holders are a great value! Much heavier made than what I had expected. I can easily display information on my products to help boost sales. As a marketing tool, this was a must! We use these in several offices and they work great! We received them quickly too! Thanks for the great review, Kaitie! We're glad our sign holders work perfectly in your offices. I have many events that feature a Silent Auction and we have over 100 items. I ordered the frames to hold info about each item. The frames are well made and much less expensive than Office Stores. The frames are thick, perfectly sized, and I think they will last for a long time. Thank you so much for taking the time to share your photo and write this great review, Liz! 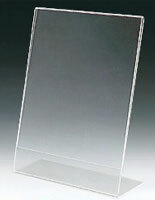 We're thrilled that these acrylic sign holders were the perfect solution for displaying prize info at your Silent Auctions, and we hope you'll be able to use them for many events. Product works great and arrive well protected against scratches etc. We're so happy to hear this, Dara! Thanks for shopping with us!